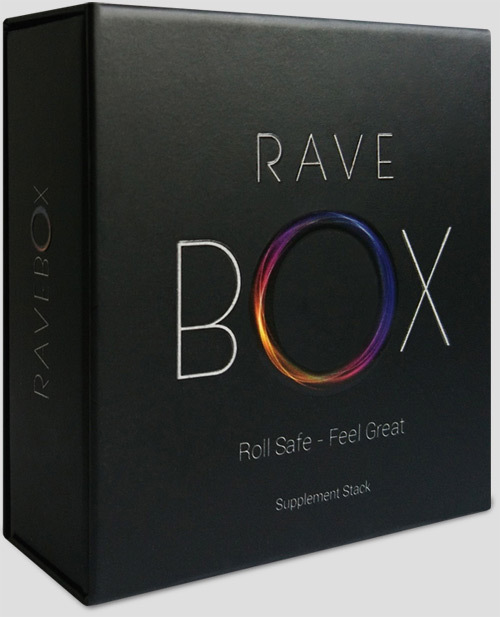 Roll safe & feel great with the supplement that everybody is 'RAVING' about! RaveBOX is all about harm reduction. It is a combination of natural supplements designed to combat the negative effects of MDMA use. It helps you to restore your energy levels, boost your immune system and sleep better, as well as replenish your serotonin levels and reduce cell damage caused by free radicals. The intervals at which you ingest the supplements are as important as the supplements themselves. For your convenience, each interval of supplements are individually packaged with instructions. For the best result, please take them as instructed on the sachets. A combination of natural supplements which will help you to elevate the level of antioxidants available to the brain before the increased oxidation caused by MDMA, potentially combatting it before it even begins to happen. Another active ingredient, magnesium, relaxes muscles and helps prevent bruxism (jaw-clenching). Pre-Party supplements have time release coating and for best results, all four must be taken 2 hours prior to rolling. Melatonin in the sleep aid sachet will help you to have a restful sleep. Melatonin is also a potent antioxidant. Sleep aid should be taken just before going to bed after the party. Each recovery tablet contains '5htp' and 'Green Tea Extract' which will help you to restore your serotonin levels while supporting the detoxification process. Recovery supplements should be used for the following 3 nights. Eat WellTry to eat as clean as possible and make sure to drink plenty of water to flush out your system. Get Enough SleepGet back to your regular sleep cycle as fast as possible. Keep ActiveDon't lie around for days in misery. Do physical stuff. Walk, run, exercise - sweat it out. You will be surprised at how much it helps. Don't Overdo ItTake long breaks between rolls. Give your body and mind a chance to restore themselves. Free Your MindThe less you analyze how you feel, the better. Stay positive. 5-HTP (L-5-Hydroxy-Tryptophan) The immediate precursor of serotonin. The production and maintenance of serotonin levels in the brain are directly related to eating and sleeping patterns, mood shifts, tranquility, and compulsive behavior. Use of 5-HTP has been shown to aid weight loss, reduce carbohydrate cravings, improve mood fluctuations as well as promote normal sleep patterns. NA-R-ALA (Alpha Lipoic Acid) A powerful, slow release antioxidant. The effects carry on to benefits that protect one from heart diseases, liver diseases, diabetes, and neurological decline with age. Magnesium Glycinate An essential dietary mineral, magnesium plays many important roles which include: helping cells produce metabolic energy, supporting optimum nerve function, helping muscles relax properly and maintaining a healthy heartbeat. Glycine has been shown to be an efficient carrier for minerals that facilitate absorption in the intestinal tract. Vitamin C An essential which supports the development and repair of the body's tissues. Because vitamin C is an antioxidant, it can reduce cell damage caused by free radicals, chemicals and environmental pollutants. Grape Seed Extract A rich source of procyanidins - water-soluble antioxidant flavonoids that are excellent free radicals scavengers and have been shown to support the capillaries and circulatory health. EGCG (Green Tea Extract) Provides powerful antioxidant protection, guarding healthy cells against free radical damage. CoQ10 A powerful antioxidant that has been shown to enhance cardiovascular function, immune health, heart health and energy metabolism. It plays a crucial role in mitochondrial function and is found in almost every cell in the body. ALCAR (Acetyl L-Carnitine) A modified amino acid that supports cellular energy production by assisting in the transport of fat into the mitochondria where it is oxidized and converted into ATP (chemical energy for the cell). Melatonin A neurohormone produced in humans by the pineal gland. A favorite of travelers, it governs the body's circadian rhythms, helping the body to ease into restful sleep. Melatonin is also a potent antioxidant. Sharing is caring. Order for your friends too and surprise them with your generosity. 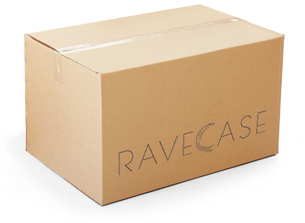 If you are interested in re-selling RaveBOX or want to buy a case or more just visit our reseller program page. Warning: You may experience some residual drowsiness. If you take this product you may sleep for a full 8 hours. Not for use by those under 18 years of age. Do not take when operating machinery or driving a vehicle. Warning: Do not take prior to or during the party. May cause drowsiness. Do not use while driving or operating heavy equipment. I live in Michigan. How long would it take to get to me? It usually takes 3 to 5 days. Hi, It usually takes a week to 10 days to arrive to a European address. How many packets of each dose come in a box? Each pack is for a single use. I am aware that the Recovery pack states, “Take one tablet before bed for the FOLLOWING 3 nights”. Does that mean you take the Recovery tablet with the Sleep Aid. The same night as the party? No, these needs to be taken the next day after the party night not with the sleeping aid. Hey Guys!! I'm Laura and I'm in Australia, how long takes the delivery to Australia? Thanks! Hi Laura, It usually take 7 to 10 days to arrive to Australia. You need to swallow them whole. hey guys! do you ship in italy?bcoz here there's a law regarding importation of food supplements. thanks in advance! In what order should the supplements should be taken and is it before or after the roll? There are instructions on the sachets. The tablets in the sachet number 1 need to be taken 2 hours before. The sachet 2 is a sleep aid and needs to be taking before sleep after the party. There are 3 number 3 sachets which are need to be taken following 3 nights. What about two to three day festivals? You can take the pre-party supplements before each party. We recommend to use recovery supplements when the party is over at the very end. Thanks for getting in touch. Due to the perishable nature of the product our supplements are sourced and made to the highest of quality, before launching we were in touch with many manufacturers before moving ahead and using our current one, everything is made in the USA is completely natural and even has a shelf life of 2 years. Can I sell your product? Yes, you can. We have wholesale, dropship and affiliate programs available. Ticket and chat support is available 24 hours a day on weekdays. Why are my orders being declined? If you have entered your card details correctly, your payment may have been declined by your card provider. The best thing to do is to contact your bank. If you think your order might have been lost, please contact us through live chat or through our contact page. Yes, we will send your tracking code as soon as your order is shipped. I loved it. Will definitely take again for my next fest!